I have always tried to have a motor (1/3HP 1800RPM) set up with a wire brush. 6" diameter with .0104 stainless wire does the best job for me. (Note: Previously I had the wrong heavier wire listed) The small wire size is gentle enough that is doesn't mar most work. You can really lean on it when cleaning rust off tool steel. The 6" diameter keeps the FPM down where the wheel does not cut. This is useful for cleaning files and removing rust from tools without hurting the finish. Note that there are other buffing compounds. Aluminium oxide is sold in 80 (very coarse) to 400 grit and is sometimes coded with colors such as green and blue to indicate type. Emery is also available in various colors and there are special compounds for plastics. However, I have used tripoli and rouge on clear acrylic and polycarbonate. The critical factor when buffing plastic is to not melt it. 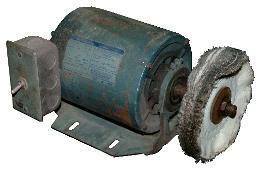 What speed are the large belt driven pedestal grinders designed to run? The old heavy cast base, floor mount, dual stone models. Anyone here have any recommendations? Big grinders come in many sizes from 8" up to 30" (200 - 750 mm). The speed is a function of wheel diameter. Generaly the limitation is the safe operating speed of the wheel which is usually about 1.5 times the working speed. This is limited by the strength of the materials which the stones are made. Speeds available are determined by the AC power frequency (60Hz) and directly coupled motors. Well. . I DID poll some catalog data after creating this chart. I was right on or a little conservative in spots. The above assumes properly rated good wheels (ring tested) mounted correctly with paper washers and flanges then speed tested and trued before use. See our iForge demo on grinder safety for shatter guard adjustment. Always consult the wheel manufacturer for ratings and mounting. You must remember that these big old grinders were designed to be VERY aggressive fast grinders. The larger ones were used to clean up iron castings that were as large a a man could convieniently lift all day. The more conservative speeds are more frindly and controllable. Slow speed grinders were often made for wire brushing as well. Those designed without motors for flat belt operation had no ratings that I could find. They assumed a skilled mechanic or plant engineer would install the machine based on the wheel size rating and use. Cutoff Machine Converting a bench grinder to cutoff.